Marco Polo helped us improve our communication. Being two adults, living 4 countries away and having lived apart for 24 years has really messed up our relationship. But since we’re still alive, we want to work on that. My brother started using this app and immediately recommended it to me. We have ourselves on Facebook, Instagram, WhatsApp… but, somehow, our conversations over there seemed very professional and distant. That’s not how you communicate with family. With family you share black and whites, good looking and just getting up, happy moments and not so happy ones, but also you do it quick. Facebook told me to edit my life and share only the greatness. Instagram told me to work on my photography skills to only share like worthy pictures. WhatsApp told me to only write what’s important. What happens to everything in between that makes life so dramatically intense or boring or tedious or frustrating? Is there a digital place where you can share something without pretending to have it altogether? Well, I think we found it. Marco Polo is an app that shares little chunks of your life with the people you care. My brother and I are using it to share those little chunks and understand the other’s life. At the beginning I was trying to find the best light and angle, because that’s what I’m used to. But then I remembered: this is my brother, he will love me with my double chin and my greasy face! So, I started sending him Polos waking up, after shower, before my eye surgery, after my eye surgery looking like a mummy, with a messy bun, with my messy waves, after yoga, after class, after swimming, etc. This app gave me the liberty to show my brother my unfiltered life so he can know me better. We talk about what’s important and what’s not, we talk about what matters to each one of us and what doesn’t, we talk about what we’re doing and what we’re about to, just as he was right by my side. One of the things that I entirely loved when he came home was one night. I needed to study for my Applied Geology lab and he needed to do some things on his phone. So, we were together in the living room but we were respecting the other’s activity. We wanted to be together but we wanted to respect’s the others time. 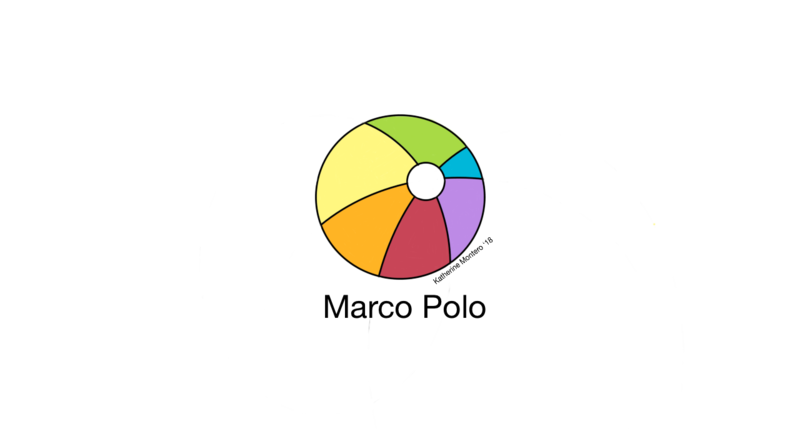 And with Marco Polo I feel the same. He can talk to me and I can catch him live or I can wait until I have a little break to watch his message. And as our updates are quick, I know we’re respecting each other’s time. Marco Polo is like a video walkie talkie. You press a button, record yourself and your message, and press a button to finish. And that’s it. It’s not complicated. I started using it, besides of my brother’s recommendation, because it was an editor’s election (it’s a reviewed app by Google) and has a lot of downloads in the Google Play. But I have to recognize I have never ever heard about it before my brother brought it up. Not even in the most popular tech zines in Latin America. The only thing I was scared of was the storage space. Not like super scared, though, because Titi gave me a phone with 16GB space. But since these were videos, I started to feel like I was going to use all of the storage really soon. But after one day of using it, Marco Polo just shows a little gif in your phone and the real video is in their servers, not your phone, so nothing to worry about storage. We have like 2 weeks or so of using Marco Polo and I feel like these 2 weeks have been the turning point of our brother-sister relationship, like, for real. We had a little talk when he came home back in May but that approach was just the beginning, we needed to nurture it and with Marco Polo we are definitely doing it. The process of using it is really simple, just press “Start” and record yourself. When you’re done, press “Finish”. And that’s it. The process of creating an account is not that complicated, either. You just have to be careful at the moment of “sharing your contacts” because it will try to spam your list. To avoid this just do not share your contacts and that’s it. What am I trying to say here is: read what appears on your screen and only share your camera and microphone. You will respect your contacts this way. Oh, and also you can create groups. So if you have more brothers and sisters, or your best friends, or your friends from childhood, or I don’t know, you can send them little chunks of your life, too. I’m about to create the family group so we can all feel closer than ever. I hope you find this app useful and it helps you like it did with us.